At the left we see the façade of the Libreria, in the centre the Loggetta and the shaft of the Campanile, and at the right is the south-west corner of S. Marco. In the foreground is the Piazzetta, with various temporary stages set up. Players and quacks are performing on the stages, and many of the figures watching the events are masked, suggesting that the painting depicts Venice’s main carnival season (which extended from St Stephen’s Day until Shrove Tuesday). This painting is one of four, all in the Royal Collection, which are signed and dated 1743 or 1744 and engraved by Antonio Visentini (1688-1782) on a larger scale and independently of his 1735 series. 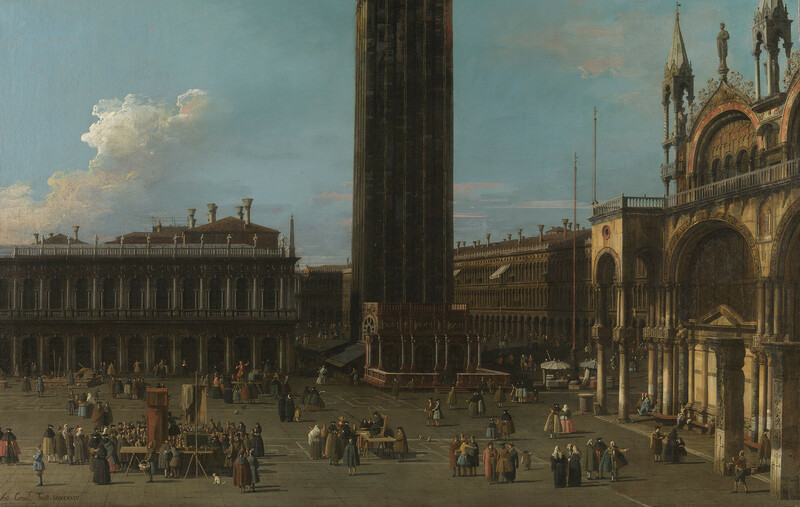 It is the companion piece to ‘Venice: The Piazza and Piazzetta from the Torre Dell’Orologio towards S. Giorgio’ (RCIN 400513). All four were engraved as in Joseph Smith’s collection and, it may be supposed, before his appointment as consul in June 1744, since that title is omitted from his name. It is thought that the group of four engravings was published by G. B. Pasquali at Smith’s expense. Visentini’s original drawing is in the Museo Correr. Signed and dated lower left: Ant. Canal Fecit. MDCCXLIV.